Premier slings come in a wide array of styles to meet a variety of client needs. The Dress Toileting High sling is a secure, easy-to fit toileting sling. Use the Dress Toileting High sling for residents who are totally dependent, partially dependent, non-weight bearing, very heavy or have limited head control. Use this sling when transferring the resident to toilet. 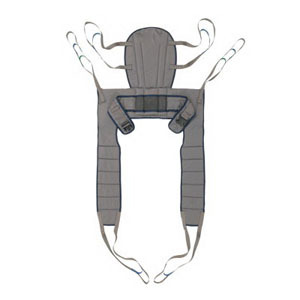 Versatile sling provides full head and neck support.